Reolink have pulled out the stops with this security camera system. The Reolink RLC-422-P boasts some extremely impressive statistics with the ability to record footage at resolutions above full HD and the inclusion of optical zoom. With this camera also packing an array of LED lights around the wide angled lens to let you capture whatever is happening in a large area at any time of day. These technologies combined with email notifications based on motion detection allow you to keep track of what is happening at any given time using one of the many comparable applications. Alternately if you just need a system for 24/7 recording this device is ideal when paired with a NVR. The RLC-422-P in it’s very sleek and professional looking dome casing is an excellent fit for any retailer store or home. Although the case doesn't provide the camera with waterproofing the enclosure is vandal proof increasing its survivability in most situations. Furthermore, to make this camera more functional the system is powered over ethernet. This means that you won’t have to run power to all the cameras in your security system but rather a single ethernet cable which will allow you to transmit the video signal and the required power along the same line. The Reolink RLC-422-P packs an incredibly high-quality camera shooting at 2560x1440p camera sporting a 4x optical lens. This allows the camera to maintain very high quality at even a long range from the target subject. The impressive lens partnered with the 24 IR LEDs allow this camera to record even in low light night vision mode at up to 100ft. Although this camera has impressive zoom capabilities it also has an autofocusing lens which can display a field of vision between 36degrees and 100degrees giving it the capability of recording a wide field of view to cover a shop floor. 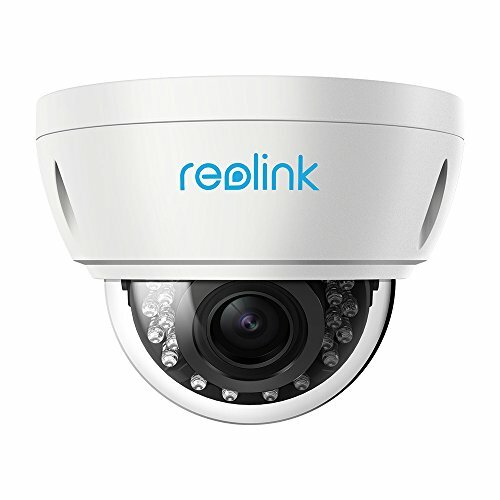 With the Reolink RLC-422-P being designed specifically with retail in mind it is more than up to the task of recording in any home security environment. The RLC-442-P is housed within a IK 10 Vandal proof housing to give it extra protection. Partner this with the POE (Power Over Ethernet) technology you can wire up to 16 of these cameras into a single system, each using up to 330ft. of CAT 6 cable, giving you great coverage of even a large store or home. With the option to use a NVR recorder or Nas Drive for recording you can leave this system to run or use an iOS, Android, Windows or Mac OSX app to view and record your video. This combined with a huge range of compatible ONVIF services gives you flexibility in how you implement the product. The Reolink RLC-422-P is an amazingly powerful camera at a very reasonable price. The camera features most importantly a very high recording resolution combined with the versatility of 4x optical zoom lens which can also offer an extremely wide field of view. With the RLC-422-P also using the power of ethernet technology it becomes very well suited to covering larger areas which would require long distances of power cable and potentially multiple wi-fi extenders that a wireless system would require. This combined with the ability to have up to 16 of these cameras running together make the RLC-422-P an excellent choice whether building a new security system from scratch or scratch or looking for something to integrate into an existing system. The camera is well suited to use in many indoor or sheltered environments and a good choice for home or business use. Although the product doesn't feature onboard storage using an SD card, it’s broad range of compatible hardware and software more than makes up for this giving you flexibility in its deployment.